I'm such a chair-a-holic (if you haven't yet picked that up from this and that). I just have a thing for chairs. I love 'em. Retro, vintage, modern... but mostly, Mid-Century. The sheer design genius that went on in the Eames era is so astonishingly simple - and yet these seating designs have morphed into iconic symbols. 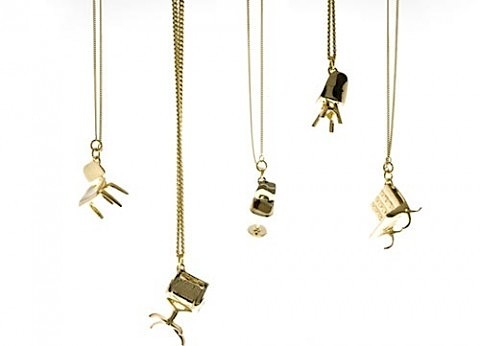 Happened upon this wearable chairs concept from BRUXE; 20th Century chair charms. 10K gold pendants for the chair happy! If Aaron Basha can make shoe pendants classic, what's wrong with a little chair-jewelry-action?? Totally lovin' it!! While I'm on the hot topic, thought I'd share this beautifully revised film; the Eames Lounge Chair debut on NBC, circa 1956! Enjoy! !